ErgoGlide®... Glide through your day ... the right way! The ErgoGlide®, a durable ergonomic extension handle adheres to sliding glass receptionist windows. The ErgoGlide® has been proven to be extremely effective for individuals seeking relief from the constant repetitive motion of opening and closing their showcase/service/receptionist sliding glass windows. Such repetitive motions often not be avoided due to federally mandated confidentially regulations. Such laws Health Insurance Portability and Accountability Act of 1996 (HIPAA) require that sliding glass windows be closed to preserve privacy unless one is actively speaking with a customer/patient. The ErgoGlide® has a unique ergonomic design which relieves the constant and repetitive strain on the neck, back and shoulder muscles. Our product assists in preventing workplace injuries by easing the pushing/pulling motion of the frequent window sliding task which, in time, cumulatively can lead to discomfort and potential harm/injury. The extension handle allows the associate to remain ergonomically positioned at their workstation while they are able to comfortably and safely apply minimal pressure to the ErgoGlide® in order to glide the window. There is no need to compromise your health in order to provide the confidentiality that your place of business requires. Are you at an awkward angle and need to lean forward to open your sliding glass window? Well not anymore! The ease of the ErgoGlide® is here!! The ErgoGlide® is available in 3", 6" and 9" lengths. With the ErgoGlide®'s adhesive bond you are able to place your ErgoGlide® in any location on your receptionist sliding glass window! Installs in minutes! Hassle free no tools required! extension handle in their home as well as that of their family members. Pictured below, one of the owners Mothers is a sufferer of Rheumatoid Arthritis. 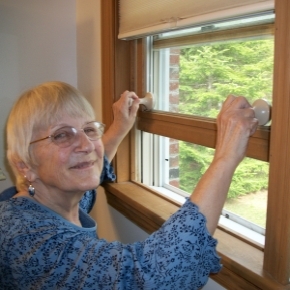 The two 3 inch length Ergoglides® mounted on a double pane window (please see Photo #2 below) have helped her tremendously with the task of opening and closing the window. 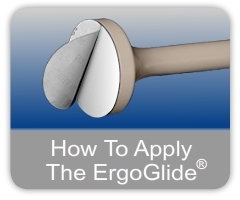 In a residential setting please note that the use of an Ergoglide® is only approved on a double pane window. 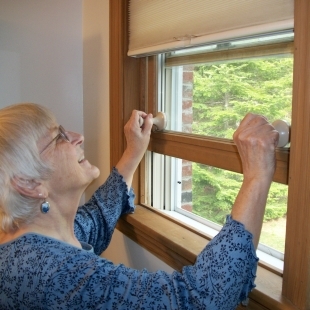 My Mother is trying to slide open the window without any extension Ergoglide® handles, she needs help to assist her opening this double pane up and down window. 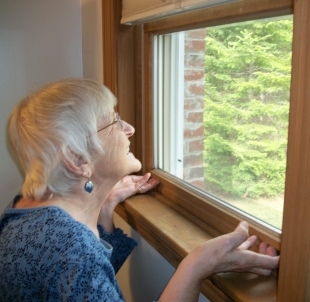 My Mother is now opening the same double pane up and down window by using two 3 inch length extension Ergoglides®. 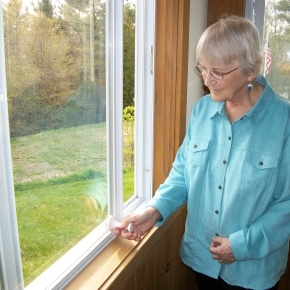 My Mother finds the 3 inch length extension Ergoglide® very helpful as she opens this porch double pane window.